Now, out in front of you, create an image, get a sense of it, feel it, let this image represent you, and set it out, at the edge of your aura. Allow any attention that is on you, to go into that image. This image absorbs and deflects the energy of attention directed towards you. Now, send a hello into the center of the planet, and bring up some Earth energy, like a line of energy, coming up through the planet. Allow your feet chakras to draw this energy up, let it flow through your legs, and when the Earth energy reaches the 1st chakra, allow it to fall back down your grounding cord. Notice what happens to your body when you run Earth energy. Next, notice the top of your head. Say hello to your crown chakra, and imagine opening it up. Send a hello out to the Universe, find an energy you’d like to bring in. Call that energy down to the top of your head. Allow that energy to flow down your back channels, on either side of your spine, into the 1st chakra. Allow the Earth energy and the Cosmic energy to mix within the 1st chakra, and then let it flow back up through the front channels. Allow some energy to flow down your arms, and out through your fingers. 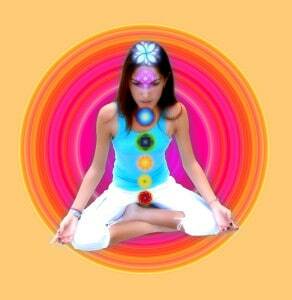 The rest of the energy will flow up through your crown chakra, and fountain out of your head, into your aura. Imagine the image, with the energy of your problem, and ground it. Create a grounding cord on that image, and first, allow anyone else’s energy that is on this problem, to drain out. This energy does not pertain to you, so let it go. Take a deep breath, notice your body, and allow any of this energy within your body, other people’s concerns, to drain out, through your grounding cord. Next, drain out of your image any sense of responsibility you might have, regarding this problem. This may be a sense of responsibility you have created, or that someone else has placed upon you. Drain it out. Notice the center of your head, and decide to let go of all responsibility. Notice what is happening to your image as you drain away the energy of the problem. Sometimes, it might just disappear, or get smaller, not seem so important. Can you get a sense of amusement about the problem? Can you see the lighter side? Can you now imagine that there might be an answer for you, in this problem? That perhaps it is something you are learning from? Growing from? Now, imagine a little gold sun above your image, above your problem, and bring into it a little lightness, and bring up the energy. Now you can ask yourself, what is my next step? Can you just let go of it? Or is there something you can do, to move towards a solution? Once the problem has been de-energized and lightened, it is much easier to see it for what it really is, and to decide what to do. Now, move this image away from you, give yourself some space from it. It does not have to be 100% solved at this moment. Once you feel you have space from it, go ahead, and put a bomb under it, and blow it up. Take a deep breath, notice your body, notice your grounding, notice your energy running and notice any changes you feel. And realize, you are more important than the problem. Now, create a big, bright, golden sun of your own energy, of your own Present Time energy. What would you like to bring into your space? Create the energy of what you want, into that golden sun, and bring that new present time energy in, through your crown chakra, filling your entire body. Picture it coming in, filling up your head, filling your body, your aura. Take a deep breath, and Be, right in the center of your head, right in this moment. When you are full, take a deep breath, bend over, stretch up, and enjoy the feeling! Download the MP3 and MP4 video instructional package, for Meditation Class 8. It is enhanced with sound therapy techniques to deepen your meditation experience.